This is the Super Bowl aftermath interpretation for 2019. This is the third time I have ever watched the Super Bowl all the way through. 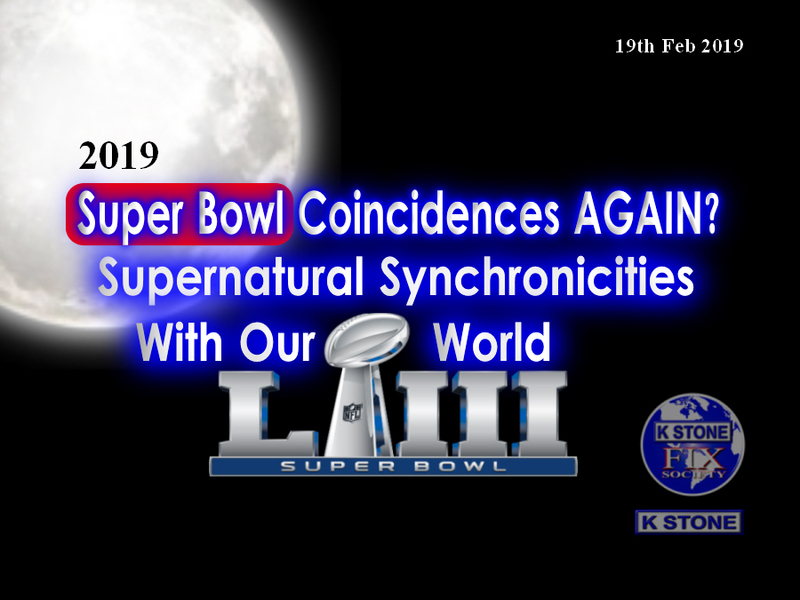 I only started watching them because I saw strange coincidences in 2017 before the game was played. The Patriots played in all three Super Bowls that I have seen. In the previous 2 years I did a run down on what was revealed about New England’s interesting similarities and meanings. Here are just three. 1. Reference of New England - England in the United Kingdom will be a “New England” after Brexit is over with. It may turn out good or bad. This has been playing out simultaneously while the Patriots were in the three past Super Bowls. 2. New England was founded on my birthday 19th May. 3. The name Patriots represent the patriotic citizens of the US, which has now spread to patriotism around the world in a number of countries. For more information about what else I found out about New England I will leave the links at the bottom so I don’t repeat here what everyone who has read them already know from those posts. Hollywood and the nation’s film and television industry are there. As Los Angeles was defeated this could be a sign that Hollywood and the entertainment industry may come into some trouble. Their problems could come because of pedophilia claims or other corruption being exposed. Maybe Sophia Stewart, the real creator of the Matrix and the Terminator, will receive compensation from the movie companies for using her manuscripts without paying her. As some of my other posts have lined up with ancient texts, I have gone to see what they say again. "And I saw one of his heads as it were wounded to death; and his deadly wound was healed: and all the world wondered after the beast." So the beast, which I worked out to be the system that runs the world at the moment, partly got stopped in its tracks (one of his heads wounded) but somehow it managed to continue to function. It may not be as strong as before. That’s what the score was. 13 – 3 the same numbers as this verse. Remember the score could have been absolutely anything but yet again it has fallen in line with some of my previous interpretations. Remember what a young male sheep is called? A lamb ram. So there you have a description of 2 ram horns in that verse. 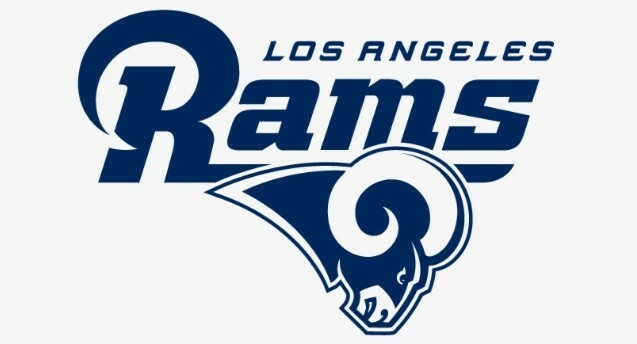 On the LA Rams helmet are 2 horns. Has this new beast with the ram horns risen in the other dimension now and a representation of it will be displayed in some way in our world? Who did the LA Rams beat to make it to the Super Bowl? The New Orleans SAINTS! The Rams were 13 points behind but they overcame the Saints 26 – 23. If you add 2+6+2+3 = 13. The number 13 shows up a few times. 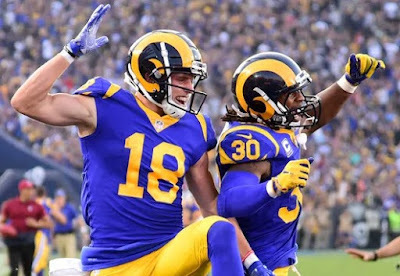 At least twice in the game between the Rams and Saints, and in the final score between the Patriots and the Rams. Does this number 13 mean something in the future or is it a reference to the chapter 13 of Revelation where I am giving you all these interpretations from? That verse is the ending of a saying about Philadelphia. Who won the Super Bowl last year? The Philadelphia Eagles! How can that be a coincidence? I say again… I am just using the final score that happened in the Super Bowl in 2019, 3 -13. I wondered why the chapters around the same theme kept coming up. The answer I got was that these chapters have been taking place over a period of time and not just in one year. We are seeing the chapters play out in our time. As I was watching the game in the 4th quarter the clock ran down to 2:33. 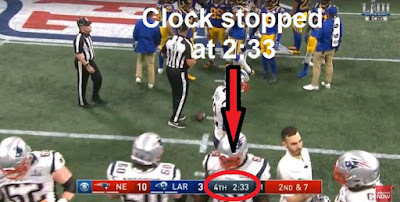 They could have rewound it to 2:43, 2:41, 2:39 or any time but 42 showed up twice at the same time. 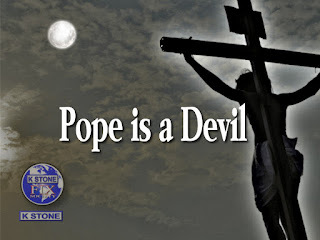 The number 42 is also mentioned in Revelation chapter 13. If you never saw my post called “Unexpected Meeting With God,” at the end of that post I shared this picture I saw in a vision. I was to move the E in front of the L and lay it on its back. 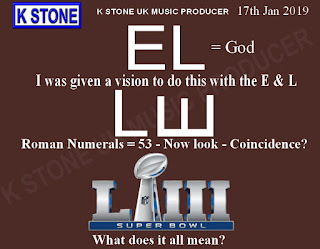 (EL means God in Hebrew).This is the picture for the vision I had. After all that is written in this post, could it mean we were given signs through the Super Bowl? Will the numbers 13 and 42 appear again in a significant way? Is this a sign where we are now at according to the history of the world? Three Super Bowls in a row and it makes it look like another dimension is speaking to us through the game. Super Bowl 2017's Coincidence With Reality? Eagles Win Super Bowl 52 (2018) What Was Justin Timberlake Promoting? 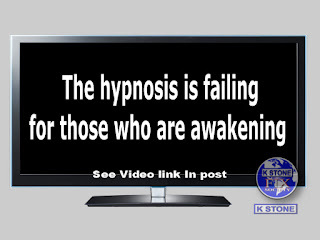 The hypnosis that the TV has had over people for many years is starting to wear off for those who are awakening. It’s time to free your mind. K STONE a music producer from the UK. "Wow..A shiver runs up my spine…"
AGAIN in Russia! 5 days after California’s Event. What’s going on? Ancient Text Symbolism Appears in France vs Belgium Semi Final! And Just that Quick Synchronicity Happens Again - Who’s Watching Us? Apocalyptic Sign As France Win World Cup - This is happening NOW? Bad News For England? - Why Belgium and England Had to Meet? DREAM: "North Korea Declaring War"
Eagles Win Super Bowl 52 - What Was Justin Timberlake Promoting? Fear in Russia: Portal Letting Aliens In? Game of Thrones - What In The World? In Just TWO DAYS Look Number 42 - Reaping Coincidence? My Post Was Blocked By Robots? SEND OUT Your Powerful LIGHT - Children Need Your Help! The Mystery of The Pain in the Forehead? PLUS: Joel Osteen Where Is Your Heart? Wales Do The Impossible - Red Dragon Rises? What Did I Just Watch? Star Trek And The Devil? What is Happening Over California? What’s Happening On Earth? Explanation Found For Another Crazy Dream?